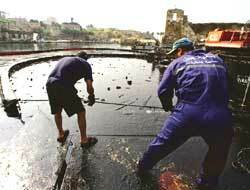 Following a truce between Israel and the Hizbollah, cleanup of the huge oil spill off the coast of Lebanon has begun. Around 15,000 tonnes of oil had spilled into the Mediterranean after the Jiyyeh power plant near Beirut was hit in an Israeli airstrike between July 13 and 15 (see 'War fallout', Down To Earth, August 31, 2006). The oil has already polluted about 150 km of the Lebanese and Syrian coasts. "Up to now, around 100 tonnes of oil has been recovered in Jbeil where an European team and Lebanese civil defence are working together," says a European Union statement. un agencies are trying to prevent the oil slick from spreading further along the eastern Mediterranean and reaching the beaches of Cyprus and Turkey.Recently, officials from the un, the eu and regional states met in the Greek port city of Piraeus to map out a strategy to clean up oil-clogged parts of the coastline at an estimated cost of us $64 million. The plan, supervised by the United Nations Environment Programme and the International Maritime Organization, prescribes immediate surveys to clean up 30 coastal sites. Meanwhile, Israel has assured safe passage for un helicopters to assess the extent of damage.